By the time she was in college, Jen Wilkin had experienced church life in seven denominations, each with its own distinctive approach to reading the Bible. One church she attended during elementary school held a Bible study where the teachers “treated us as capable of learning and understanding the Scriptures, and then gave us tools to do so.” This early investment in showing kids how to study the Bible for themselves changed everything for Wilkin. “Hearing different pastors teach the same passages in such different ways had been an eye-opener,” she says. “It pushed me to want firsthand knowledge of the text.” By her twenties, Wilkin understood it was possible to drown in waves of opinion. If she was going to learn to swim, she would have to learn to read the Bible for herself. That early flame of passion for engaging directly with God’s word continues to fuel Wilkin’s prolific teaching and writing ministry, based in Flower Mound, Texas, and The Village Church. Her spoken and written words over the years continue to encourage believers of all ages and from all backgrounds to actively engage with the Bible for themselves. Rather than striving to supply all the answers, Wilkin focuses her energy on building the church’s capacity and confidence in handling the biblical text. “We need to train people not just in how to apply the Scriptures, but also in what they actually say,” she says. We can’t build biblical literacy—that is, knowing what the Bible is about and how to interpret it—without building Bible literacy, in the sense of knowing what the text really says. Wilkin provides an example from her own life. Early in her Christian faith, she had been taught that when Job says “what I feared has come upon me” (Job 3:25) he was giving permission for suffering to come. The practical conclusion she drew was that she should never speak of her fears out loud, because that would give them power. However, when she started to read Job for herself, the text made it clear that “permission for those things to happen had been granted by God for a greater purpose” (Job 1:8–12). Scripture actually evoked compassion rather than condemnation for Job’s fears. “His fears were so ubiquitous, and so common to the human experience, that the poor interpretation lost all its power,” Wilkin explains. Knowing what the text plainly said about Job (Bible literacy) made a world of difference in helping her evaluate what other people were claiming about the text (biblical literacy). Wilkin wants to put the ingredients for Bible literacy in every believer’s hands. If our spiritual nourishment depends on our biblical “diet,” Wilkin sees her ministry as teaching people to “develop healthy eating habits.” Topical studies, like pre-prepared meals, can have a place in our spiritual diet, but there is no substitute for a deep knowledge of nutritious whole foods. “Not everyone has the gift of teaching,” Wilkin says, “but we’re all responsible for being active learners.” She knows the learning curve can seem impossibly steep, but “this is where the typical student needs a little bit of permission and a little bit of a nudge.” For Christians who want to be faithful to God’s word, refusing to learn isn’t an option. Wilkin believes that growth in Bible study can help foster unity in the church. “One of the reasons we see such a lack of graciousness right now among believers is related to Bible literacy. We’re arguing other people’s opinions,” she says. “But I find that once we actually get into the weeds of looking at passages that have been used to prove a particular point, I often become less dogmatic about a position than I was beforehand. I may still see my position as valid, but I’m going to argue it with more of an open hand.” Just as water helps the earth produce “bread for the eater,” God’s word, generously sown, will accomplish his purposes (Isa 55:10–11). Wilkin longs for people to be deeply nourished by the Scriptures. The feast is there for the taking; all we need is a little bit of permission and a little bit of a nudge. 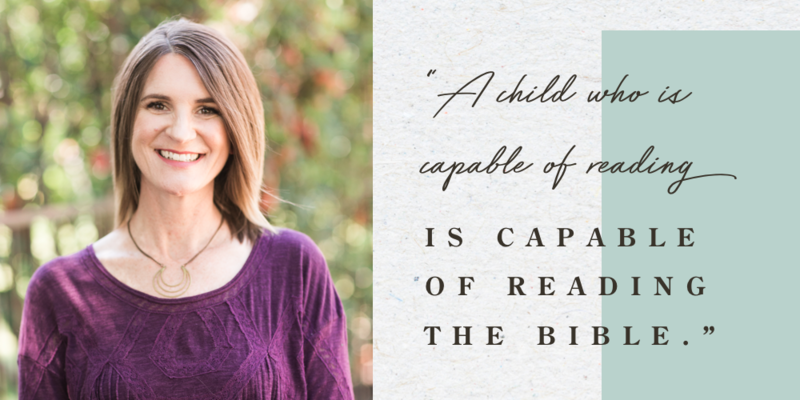 Bronwyn Lea is a South African-born writer, Bible teacher, and international speaker, living in Northern California with her husband and three hilarious kids. She loves introducing people to each other, to Jesus, and to great books. You can find more of her wordsonline at www.bronlea.com and connect with her onFacebook andTwitter.